The Limelight hydrangea that we planted on the dining patio this past spring are in full bloom. After having worked all last summer on building the dining patio (go here and here), it was truly wonderful to begin this summer with the sole task of setting up the table and chairs. The vigorous growth of the Limelight over the past few months has really added a nice texture to the dining patio. Aren't the Limelight blossoms sweet? We are still working on finishing the dining room. Between enjoying our recent company, Hubby's work obligations, and the sheer lack of hours in the day, there's still some painting to do and a few odds and ends to pull together. As a result, we've been enjoying the dining patio more than ever. We never tire of eating outdoors on these beautiful warm summer days. Mmmm...don't you just love summer. UPDATE: new table and chairs here. What a beautiful hydrangea. I just might have to find one - yours is the second blog this evening to feature this plant. Yes I do love summer and I love your pictures of patio and flowers. I have a couple hydrangias but not limelight. I might need to get that next year. Hope you are feeling well. My absolutely favourite flower and I can't grow them here...sob, sob, sob! At least I can enjoy looking at your beautiful photos and use my imagination!!!! I was scrolled past the first image thinking: "Must tag this in my inspiration file for my dream house yet to be built. I wonder what mag this image is from?" Didn't look at what blog I was reading until I started reading the actual post. Smack forehead, of course it's Trina's beautiful house and beautiful photos of beautiful house. How silly of me. What a pretty patio. I simply can not get my hydrangeas to cooperate.. I envy yours! Looked back at your posts and WOW! What a LOT of hard word has been put into the area - but my is it worth it :o) It's just perfect, and the hydrangers are certainly in the 'limelight'. I'm happy that you can sit and enjoy it all this year. Oh my, it looks like a magazine cover! Just beautiful. Unfortunately for us, the summer heat has gotten the best of all of our beautiful flowering shrubs. Oh well, there is always next spring to look forward to. I LOVE hydrangeas but NEVER knew what those type were...I have several of the pink and blue blossoms but always wanted that shade but all along have thought it was just the soil changing the coloring of the blooms....thank you & GORGEOUS :) how are the babies & momma-2-be these days??? I totally love it...every single part!!! Bet that hammock isn't too far away, and I hope you're enjoying lots of time taking in the views of all you hard work! This is beautiful... I love hydrangea... lovely photos & set! Your patio is elegant. The limelight hydrangeas are stunning making me want to plant them even more. The brass candlesticks are a lovely touch. I'd want to eat out there every single night...but not in the Florida heat! 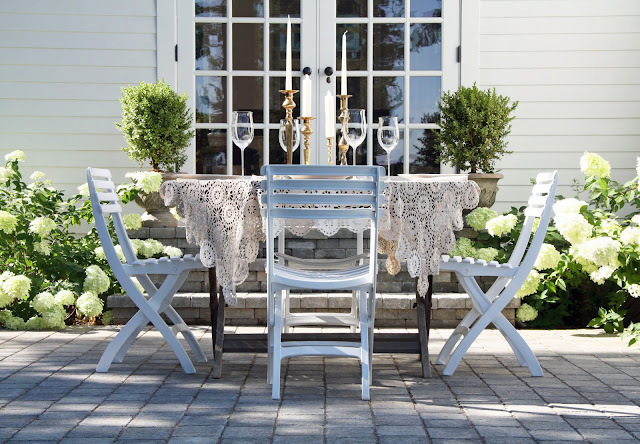 There's nothing like dining alfresco! Happy & excited to see the top pic in my blogroll thumbnail !!! Trina, ya'll have done it. The fantasy, hardwork, time, now the styling & enjoyment. Alas, I'm jealous of your Limelight. 6 weeks 3 days no rain combined with temps up to 100f. Crispy Limelight here. I love your outdoor dining room. I would be eating as many meals as the weather would allow. Just stunning! Oh , going to your old stomping ground today, Maine. My husband and I are going to Old Orchard Beach to visit friends. Will be visiting a few of the amazing lighthouses.Cant wait the weather in New England is perfect today. I love the fact that you have a "dining patio". Brilliant! As a NYC apartment gal I am jealous of your space - and your gardens - but now I have something to add to the journal I keep of my "dream cottage". #1 is a "dining patio" . Thanks for the inspiration! Trina, you guys are doing such a great job with your house! I love out door dining, and what could be better than long hours, good food and dining with friends, or simply the one you love? Check out this post, as I am sure you will love and appreciate the endless summer vibe! What a beautiful setting!! Enjoy. 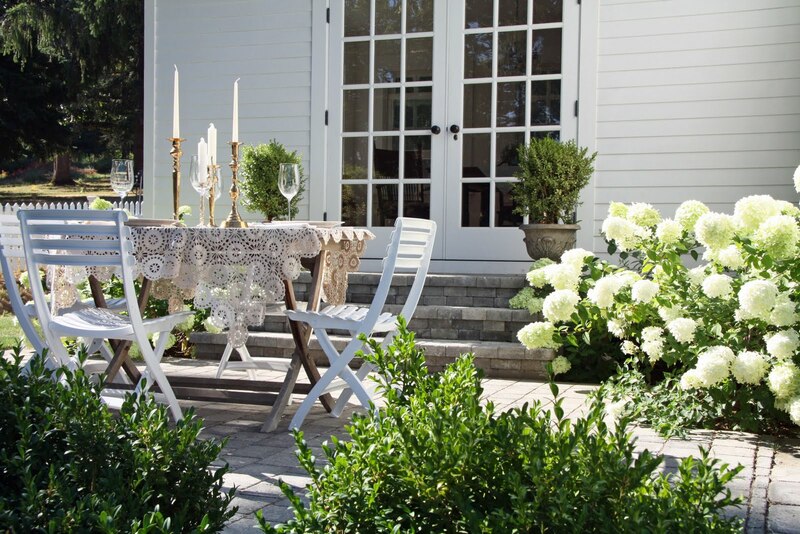 Your dining patio table is just divine and your hydrangea is the perfect backdrop. I'm SO jealous...my poor hydrangeas have just fried here in our summer heat. Top photo is definitely fit for the cover of Country Living. What a beautiful job you've done with this patio area! I especially like the way the hydrangeas spill over onto your steps... I have one of these hydrangeas, as well as many other kinds, this one is my favorite. i'm on vacation and you are making me homesick! i can see that carrying twins has not affected your ability to put together an amazing post. the styling and photography are perfection. mother nature at her best and you've captured it again for us. and i also just read your frenchtoast and berries post. i'm really homesick and missing my kitchen in the worst way. don't tell larry. It's charming Trina! So happy y'all are enjoying the fruits of your hard larbor! Beautiful. Stunning. I love the Limelight Hydrangeas. Every element blends so beautifully in this photo that it all looks so stunning together. This is incredibly beautiful!! The setting, the tablescape, the flowers, just perfect!! And the photos are gorgeous! What happy lively flowers....I miss hydrangeas...they aren't happy in the tropical heat! Gorgeous. Limelight is just my fav. LOVE the color. This year though, mine have grown freakily tall (too much water? )- to like 8 ft. Did you know they just cam out with "Little Lime"--a bit more compact and smaller. Going to plant some of those in the fall. I recently came upon your blog, and wanted to tell you that your rooms have thrilled me. Your blog has become the one I go to, to keep me on track in my decorating as I often veer off in multiple looks. One peruse through your posts and I am inspired to keep going in my place. Thanks! Please keep posting, and please keep this blog open. I love it. These are gorgeous! I wonder if you know if deer like to eat hydrangeas? We have to be careful of deer at Kootenay Lake Village, but these are so beautiful that I'd like to risk it! So beautiful! I so wish we could dine outside. Unfortunatly here in GA the mosquitos would carry us and our dinner away. The table setting is lovely and the limelights are gorgeous! 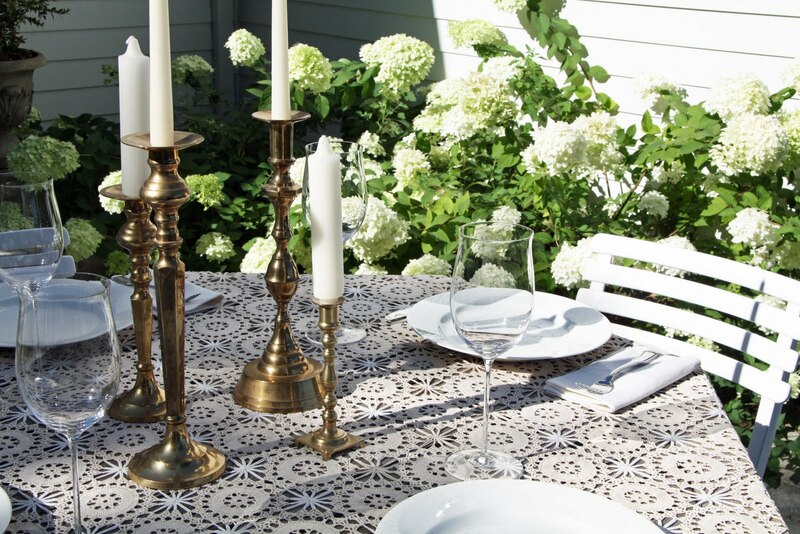 Love the lace tablecloth and assorted brass candlesticks, Trina!! By the way, we drove right through your town week before last - lovely! Oh, I love hydrangeas!! Yours are so beautiful. Sadly I can't seem to grow them. It's so nice to vicariously enjoy them through your lovely blooms (on that oh-so-lovely patio) Thanks! Such beautiful images! Hydrangeas are one of the most beautiful flowers. It just doesn't get any prettier than that! Oh my gosh...just found your blog! will be adding you to my blog roll! 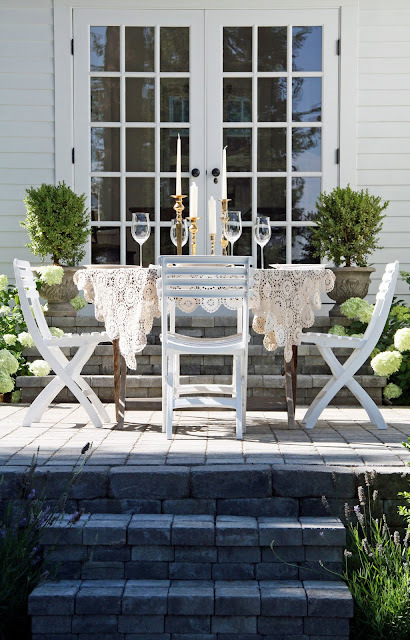 come on over for my white flower farmhouse give away! Absolutely beautiful! I hope you are taking the time to relax and enjoy the fruits of all your hard work. Gorgeous. Summer evenings when the shadows are long...ahh, nothing else like it! The patio is perfect...well done to the both of you! 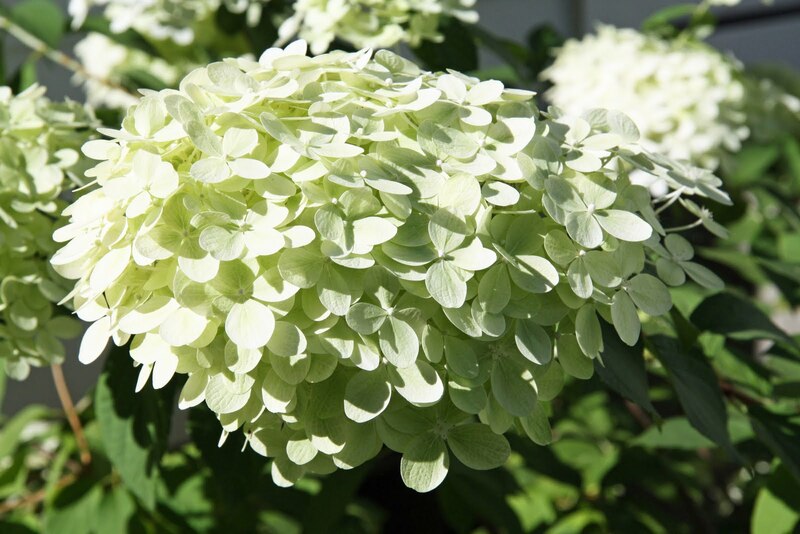 Limelight is such a beautiful hydrangea...so airy, and the limey tinge is lovely with all the surrounding white. Congratulations on finally being able to enjoy your wonderful outdoor space. Well deserved! Your patio is absolutely stunning! Love the Hydrangeas! I planted three Hydrangeas in our front yard this year, and I can't wait to plant more. Hi Trina! I'm loving those Limelights! :) I have them across the front of my front porch and they're happily blooming now. So very pretty! Your patio is awesome, girl! This is a breath of fresh air post! What a lovely and romantic outdoor nook. Lovely, Just lovely! I want those Hydrangeas. On another note, I hope you are feeling find and that the babe is growing healthy. Your blog is in my Google reader. The thing I dislike about that is making comments is so much harder. I enjoy that your home. Your attitude and home are so comfortable and authentic. Your patio is SO beautiful! Hope You are feeling well. Gorgeous! I love it's simple beauty. I love dining outdoors - especially with good food, good wine and good friends! Soooo pretty! I hope you don't mind. 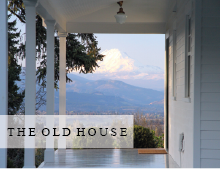 I added a link to my Porch and Garden Party on First a Dream. Lovely - can I come dine on your patio? It looks amazing and I also love the way you set the table so fancy even though outside. Such a stunning patio! I love your style. WOW! Your patio is stunning, looks like the picture was taken right out of a magazine! Love our blog! Your photos are spectacular! My gosh, your place looks like a bed and breakfast, people would PAY to stay over in your place!! !